3 Fun Arabic Letters Memory Games in the one box. Children will love to play these games and they won’t even realise they are learning the Arabic letters. Sturdy hard cardboard pieces and playing boards, 60 cards in total. Four levels for easy learning. 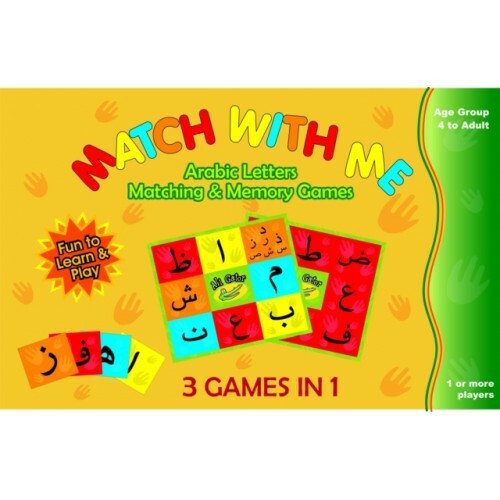 The “Match With Me” color coded system of learning Arabic, groups the Arabic letters into 4 distinct groups for easy learning. Combine with the Arabic Letters Posters and Jumbo Flash Cards the Match With Me Memory Game will help children grasp the uniqueness of the shapes of the Arabic letters faster than you will believe.